As workers repair Puerto Rico, a group of utilities say they have a plan for the island's future grid. In a 63-page report released Monday, a working group of electric experts detailed a plan for $17.6 billion in updates meant to revitalize Puerto Rico’s devastated grid. 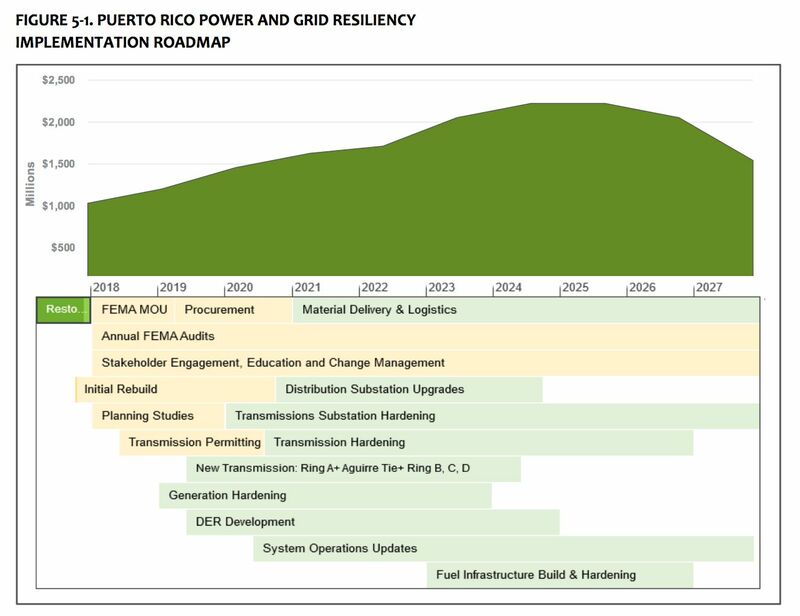 The suggested measures come from the Puerto Rico Energy Resiliency Working Group, a collaboration forged by New York Governor Andrew Cuomo’s office between New York Power Authority and the Puerto Rico Electric Power Authority (PREPA), electric trade organizations, and the U.S. Department of Energy. The resulting document sets out an ambitious overhaul of the island’s electric system. The “build back better” strategy considers immediate restoration efforts, but stretches hardening and resilience measures into the next decade. Renewable energy technologies play a central role. High-level rebuilding recommendations include six measures that together should prepare Puerto Rico for an upper Category 4 disaster. Many of the recommendations echo what has already been suggested for the island -- including undergrounding specific lines, instituting modern grid control systems and automated distribution systems, investing in distributed resources, and replacing infrastructure with hardier materials -- but the report also offers thorough details on damage when available and cost estimates. The changes come with a hefty price tag. 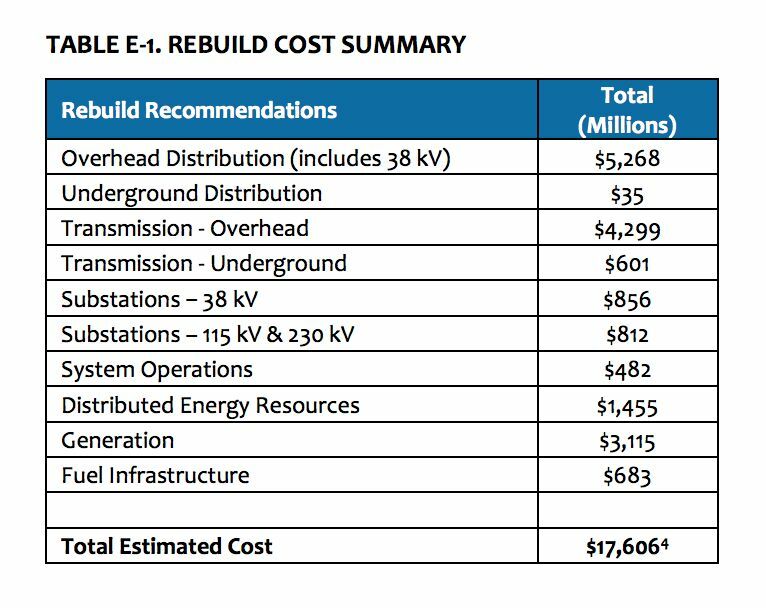 The group estimates the island needs over $5 billion in distribution system updates, nearly $5 billion in transmission updates, and $1.45 billion in distributed energy resources (DERs). Puerto Rico built much of its transmission system over five decades ago. Disrepair plagues the system. And crews have difficulty accessing systems installed before the island’s major highway network was rolled out. The group recommends abandoning many of the existing transmission lines, of which only 15 percent are built to Category 4 standards, and starting from scratch with lines along highways. 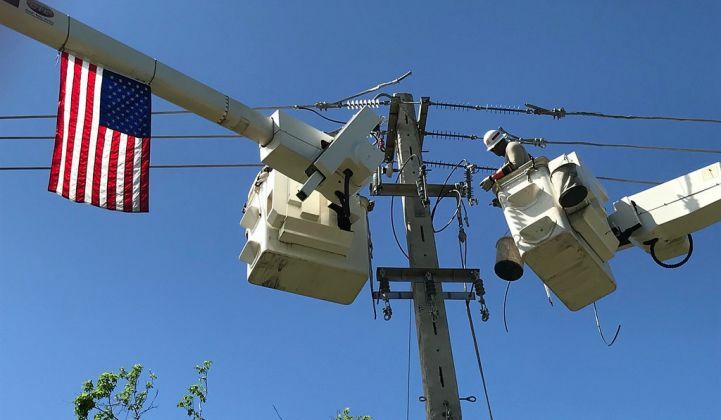 Under the group’s scenario, crews would relocate and upgrade 350 out of 2,478 miles using high-strength insulators, monopole steel poles, and conductor spacing that prevents toppling in wind. Up to 75 percent of the distribution system’s 1,200 circuits also need repairs. Only 6 percent of distribution lines are underground, and the group suggests crews underground more lines in select areas. Crews would also install lines on the opposite side of the street from transmission lines to keep single events from causing double failures. Automated switching and sectionalizing devices would protect overhead wires. The report recommends crews rebuild both the distribution and transmission system to incorporate more DERs and renewables. The working group suggests concentrating onsite solar arrays, storage and microgrids at critical infrastructure sites: 26 hospitals, 20 police departments and 20 fire stations, along with 75 microgrids at emergency shelters, and at 10 percent of wastewater and water treatment facilities. Because 470,000 homes need repair or reconstruction, workers could incorporate solar there, too. The report’s substation hardening segment borrows the Post-Sandy “defense in-depth” concept used by New York and New Jersey utilities such as Con Ed. The group, which includes Con Ed and the Long Island Power Authority, recommendeds the island harden at least 90 percent of its 334 substations. Those measures include relocating significant equipment and structures to higher ground, installing pumps, and using heavy-duty sandbags wrapped in metal mesh as barriers to protect buildings. The group’s implementation roadmap shows restoration and initial rebuild of the system continuing into 2020. The highest investment will come post-2022, as distribution substation upgrades, transmission hardening, and generation hardening continue. For now, these plans are a long way off. Meanwhile, day-to-day rebuilding trudges on. Fluor Corp., a contractor already at work on the island, last week received a three-month rebuild contract for $831 million. That's a paltry sum compared to what the Resilience Working Group says the island needs, but large compared to contracts such as the one awarded to Whitefish Energy. Approval for additional aid will likely have to wait for Congress to sort through its ongoing work on tax legislation. Still, more workers arrive every day. Over the weekend, seven “incident manager teams” from electric companies and utilities deployed to the island to assist PREPA and the U.S. Army Corps of Engineers in coordinating restoration. Over two months after Hurricane Maria, that brings the total number of workers in Puerto Rico to over 3,000. The island is now at just over 63 percent generating capacity, down from 68 percent last week.